One of my favorite vegetables to grow in my garden are green beans (the pole bean variety). Each year after the threat of last frost has passed, I sow the green bean seeds in my garden. 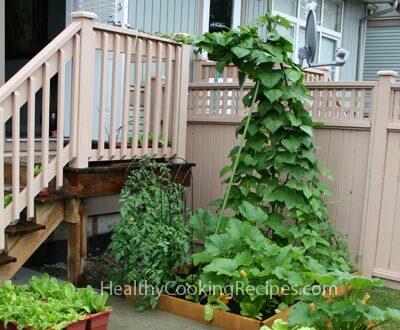 There are many different varieties of beans that you can grow, but we will be mostly discussing growing green beans here, and specifically, growing the pole bean variety. I grew my green beans in a raised bed using 12 feet poles for them to climb up. As you can see from the photo, they grew well beyond 12 feet, where I had to extend from the top to go side ways using another bamboo pole to the fence on the stairs. By season's end, the green beans had wrapped around the fence by several feet - my guess is it reached at least 15 to 16 feet tall. I don't see a reason to clip them off at the top since they continue to produce beans - so I just let my green beans grow as tall as they want. Green beans need a lot of fertile soil to grow in, so your soil should be well drained, and at least 8 inches deep. After the threat of last frost has passed, sow the seeds outdoors. For bush beans, the seed should be planted 1 inch deep and 5 to 6 inches apart. The rows should be spaced out about 2 feet apart. For pole beans, the bean seed should be planted 1 inch deep in the soil, and spaced out 4 to 6 inches apart. Rows should be spaced out 2 feet apart. Alternatively, you could plant pole beans in hills of 4 seeds each. You should sow a few extra seeds to replace any seeds that fail to germinate. Install the pole supports for your beans to grow up on right at the start, so that you do not disturb the roots later on. It typically takes 10 to 12 weeks for the beans to reach maturity. 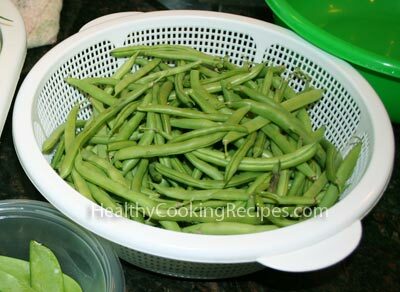 You can start havesting green beans once they reach about 6 inches. They should be picked often before the beans inside start to bulge.